Chile peppers are a diverse group and come from one of 3 species of the genus Capsicum: C. annuum (most chile peppers), C. frutescens (Tabasco), and C. chinense (Habanero). 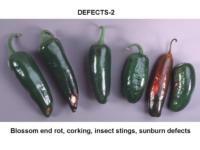 Chiles should be cooled as soon as possible to reduce water loss. 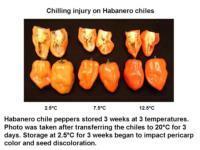 Chile peppers are not as chilling sensitive as bell peppers. 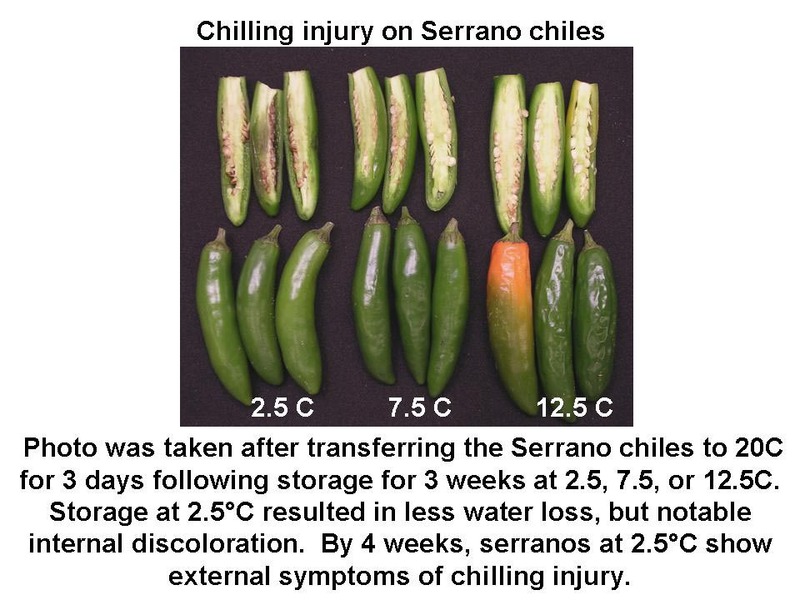 Chile peppers stored above 7.5°C (45°F) suffer more water loss, shrivel, color change and decay. Storage at 7.5°C (45°F) is considered the best for maximum shelf-life (3-5 weeks). 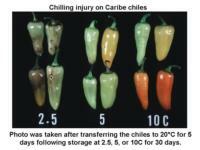 Chiles can be stored at 5°C (41°F) for at least 2 weeks without visible signs of chilling injury. 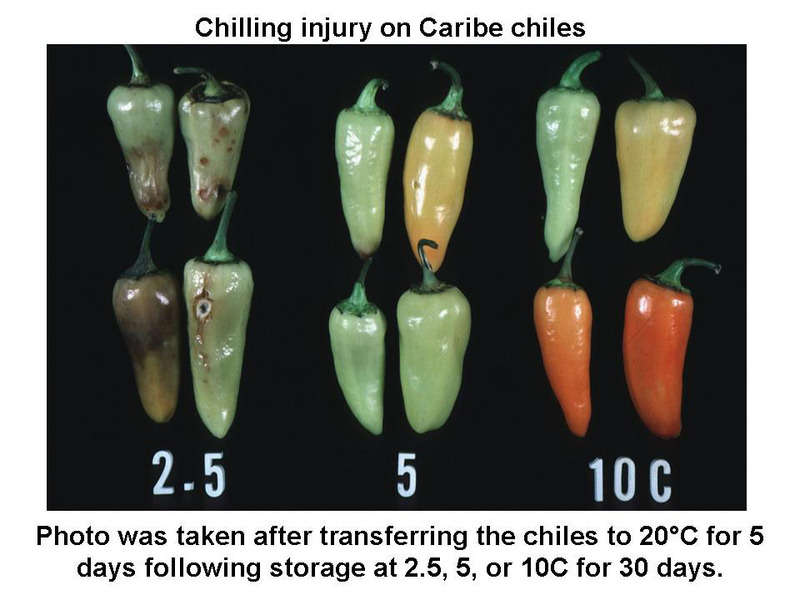 Storage at 5°C reduces water loss and shrivel, but after 2-3 weeks, chilling injury is mostly detected as discoloration of the seeds. Symptoms of chilling injury include pitting, decay, discoloration of the seed cavity, and excessive softening. 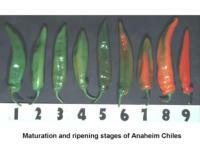 Ripe or colored chiles are less chilling sensitive than mature-green chiles. 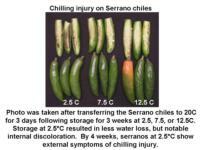 >95%; the firmness of chile peppers is directly related to water loss during storage. To calculate heat production multiply ml CO2/kg•hr by 440 to get BTU/ton/ day or by 122 to get kcal/metric ton/day. 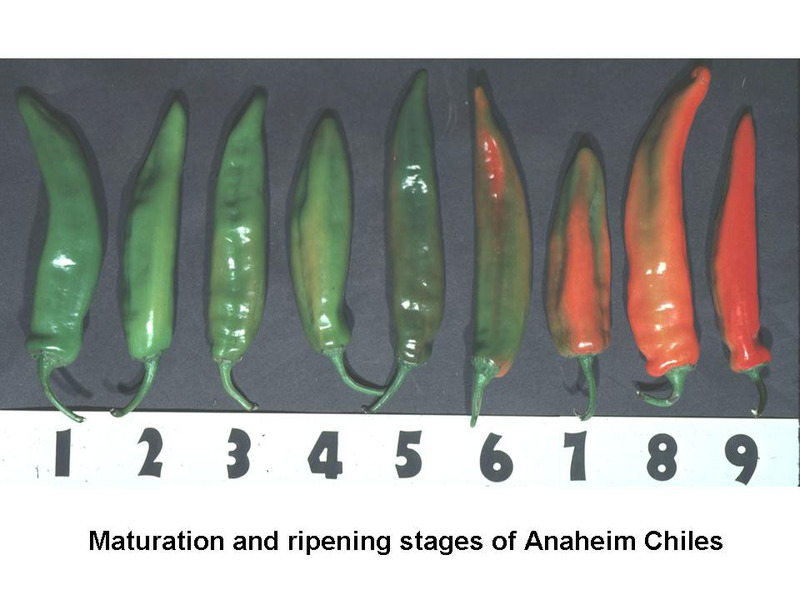 Respiration rates of chile peppers vary considerably depending on the specific type or cultivar. Jalapeno chiles have lower respiration rates while Tabasco and Chiltepin have very high respiration rates (higher than those indicated above). 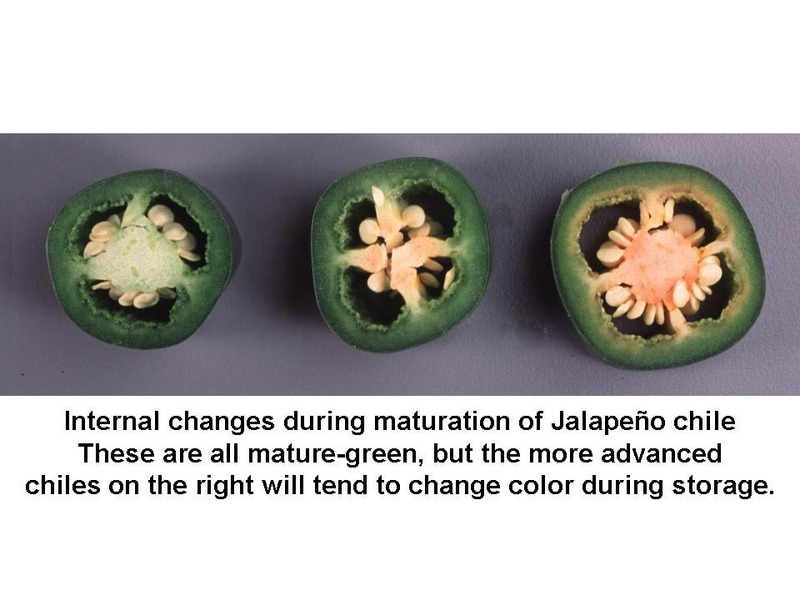 Some chiles such as jalapeños show a nonclimacteric physiology during color change and produce very low levels of ethylene: 0.1-0.2 µl/kg•hr at 20-25°C (68-77°F). Other chiles such as Habaneros show increases in ethylene production during ripening and may produce over 1 µl/kg•hr at 20-25°C (68-77°F). Responses to ethylene depend on the particular variety of chile. 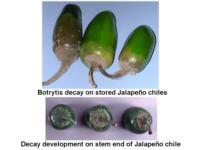 Chile poblanos for example may respond to ethylene treatment, while Jalapeño peppers do not. 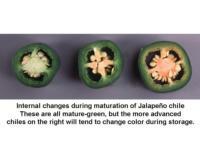 As with bell peppers, holding partially colored chile peppers at warmer temperatures of 20-25°C (68-77°F) with high humidity (>95%) is effective to complete color development. Adding ethylene may further enhance ripening but response is variety dependent. 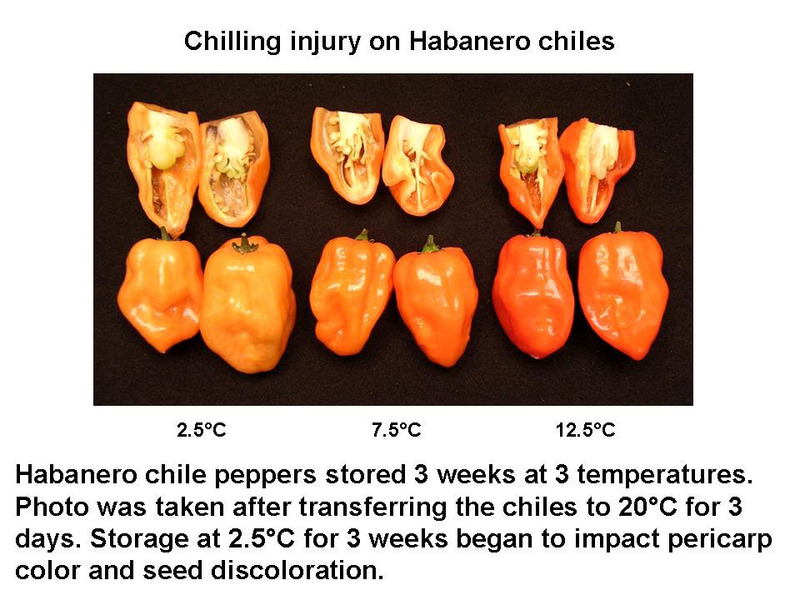 At recommended storage temperature (7-8°C), controlled and modified atmospheres of 3-5% O2 in combination with 0-5% CO2 are considered to provide only slight benefit to chile peppers. Low O2 atmospheres may retard color development. High CO2 atmospheres (>5%) can damage mature-green chiles (pitting, discoloration, softening), while colored (fully ripe) chiles are more tolerant of CO2. Blossom end rot. 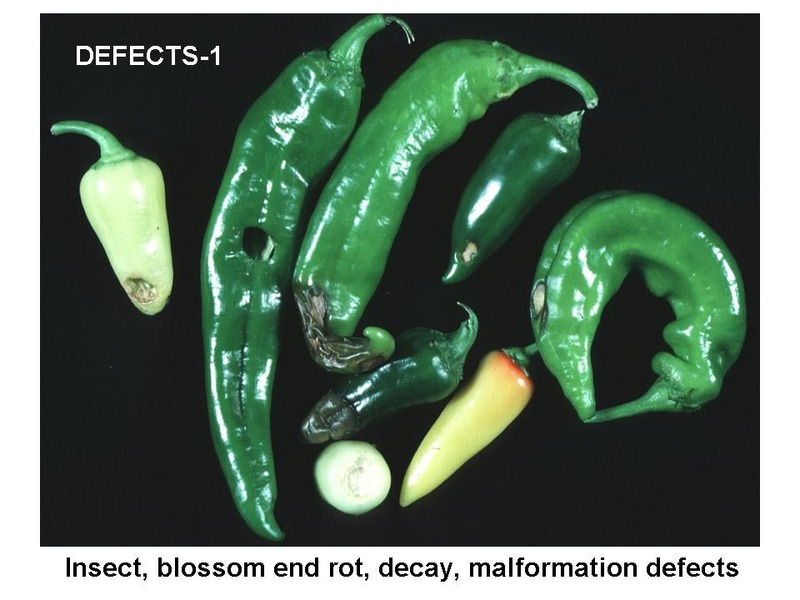 This disorder occurs as a slight discoloration or a severe dark sunken lesion at or near the blossom end; it is caused by temporary insufficiencies of calcium due to water stress and may occur under high temperature conditions when the peppers are rapidly growing. Chilling injury. Symptoms of chilling injury include surface pitting, water-soaked areas, decay (especially Alternaria), and discoloration of the seed cavity. Common decay causing organisms are Botrytis, Alternaria, and soft rots of fungal and bacterial origin. Botrytis or Grey mold. 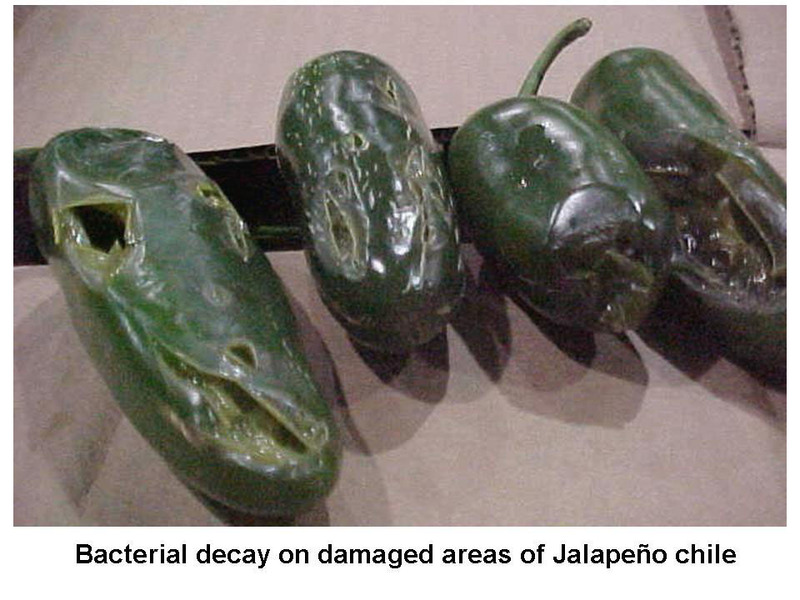 A common decay-causing organism on chile peppers; field sanitation and prevention of wounds on the fruit help reduce its incidence. Botrytis will grow well at the recommended storage temperatures. Hot water dips of peppers can effectively control botrytis rot (55°C [130°F] water for 4 minutes) without causing fruit injury. Bacterial Soft Rot. Soft rotting areas can be caused by several bacteria which attack damaged tissue; soft rots can also be common on washed or hydrocooled chile peppers where water sanitation was deficient. Mechanical damage (crushing, stem punctures, scrapes, etc.) is common on chile peppers; physical injury not only detracts from the visual quality of the chiles but also causes increased weight loss and decay. The pungency or hotness of chile peppers is due to capsaicinoids (capsaicin is the main one) and hotness varies depending on the cultivar or genetics of the chile peppers. Environmental factors and maturity of the chiles also affects the capsaicin concentrations. Chiles that are stored under a range of temperatures and are still of marketable quality maintain their capsaicin concentrations. For U.S. markets, corking (corky striations on the fruit surface) is considered unattractive. However in other markets, corking is a recognized characteristic of certain cultivars and is usually associated with jalapeño chiles that are prepared in oil and vinegar as a side dish.